Lomé, Togo—The prime minister of Togo met with UPF chairman, Dr. Thomas Walsh, to plan future projects with UPF. Lomé, Togo—The national inauguration of the International Association of Parliamentarians for Peace (IAPP) was held in the Lomé Congress Palace, the home of the National Assembly. Sendai, Japan — A delegation of officials from Togo who had come to Japan for a UN conference met with UPF-Japan and local Ambassadors for Peace and prayed for victims of the 2011 earthquake and tsunami. Sendai, Japan - A concert by a Togolese singer, Mr. King Mensah known as the “Golden Voice of Togo,” was held in Sendai on May 24, 2014, in celebration of Africa Day. Paris, France - Mr. Joël Alodjinou recently came back from Togo, in West Africa, where he inaugurated a school for 150 students in Lébé Nyamadji in the Zio prefecture. Lome, Togo - A presentation on "True Families as the Solution to the World's Ills" marked the Global Day of Parents in Lome on June 1. It was presented by Rev. 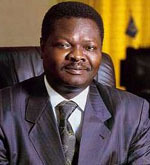 Henyon Kokou, national leader of the Family Federation for World Peace. He was introduced by Rev. Kagni S. Dieudonne, Secretary General of UPF-Togo. Lome, Togo - The International Day of Families was commemorated on May 18 with a speech on the "Family as the School of Love and Peace," given by Rev. Henyon Kokou, national leader of the Family Federation for World Peace. Sendai, Japan - In order to revitalize the Tohoku Region in Japan, the worst-affected area of the March 11, 2011 earthquake and tsunami, and also to celebrate the Independence Day of Togo, a music concert was held on April 28 in Sendai city of the Miyagi prefecture, one of the central cities of the Tohoku Region. Lome and Kara, Togo - To commemorate the International Day of Peace, UPF-Togo organized two conferences on September 21: one in Lome, the capital, attended by 350 people, and the other in the region of Kara attended by 150 people. Lome, Togo - To help resolve the nation’s current social and political crises, leaders of UPF-Togo traveled to significant towns in the country during 2010 to sow seeds of peace and reconciliation. Lome, Togo - Afin de contribuer, aux cotés du gouvernement togolais dont la plupart de ses membres sont des Ambassadeurs de Paix, à la résolution de la crise socio- politique que traverse notre Pays actuellement, la FPU-TOGO s’est engagée à parcourir certains milieux sensibles du pays pour semer les graines de la réconciliation et paix à travers la distinction des autorités administratives locales en tant qu’Ambassadeurs de Paix. I understand that good leadership should first of all the conquest of the self. Then it should be serving others. Finally, leadership is parenthood. Je comprends donc qu’un bon leader doit d’abord se conquérir lui-même avant de commander les autres. Ensuite, il doit servir les autres. Enfin, il doit être un enseignant et un maître, mais avant tout il doit être un parent. In the Christian churches, when the theme of peace in the world is addressed, the tendency is to deal only with the question of how to apply the work of Christ to the people’s present lives. Although the Bible shows that God’s work extends to the whole of humanity, peace tends to be limited to a few privileged countries on a few continents. Si nous essayons tous de pratiquer l'amour vrai, sans se soucier ni de l'apparence ni des préjugés, nous pourrons ressentir la liberté d'être unis les uns avec les autres grâce à ce même amour. Je pense que l'Eglise au plan mondial peut exercer une plus grande influence dans la réalité quotidienne de notre temps pour promouvoir la paix entre les nations si elle pratique vraiment les enseignements du Christ et collabore avec l'ONU. Congratulations to UPF Ambassador for Peace Mr. Komlan Mally on his recent appointment as the new Prime Minister of Togo on December 03, 2007. Eight American Christian leaders arrived from Benin at Hila Condji, on the Benin-Togo border on November 13, to deliver the UPF peace message in eight locations around the country.